Nijo Castle (二条城, nijo-jo) is the flatland castle located in Kyoto. It is one of the most famous spot in Kyoto. Nijo-jo was built by Tokugawa Ieyasu for Shogun residence in Kyoto. 3rd Tokugawa Shogun, Iemitsu completed the construction in 1622. 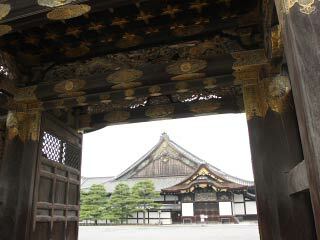 Nijo-jo has the great feature of Momoyama Style Culture and Art. As the castle of Kyoto, Nijo-jo appears in many historical scenes till the end of Edo period which is also known as Meiji Restoration. There are many historically important buildings including National Treasures. Also, it is designated as one of UNESCO World Heritage Site of Kyoto. Admission: 600 for adult. 350 yen for junior and high school. 200 for elementally school. free for kids. There is a group discount from 30 persons. Close at: Tuesday of Dec. Jan. Jul. Aug. Built in: 1603 by Tokugawa Ieyasu. The castle was originally built in 1603 as the official Kyoto residence of the first Tokugawa Shogun, Ieyasu. It was completed in 1626 by the 3rd Tokugawa Shogun, Iemitsu, with the additional of some structures transferred from Fushimi Castle. Nijo-jo is one of the finest examples of early Edo period and Momoyama culture in Japan, as it makes splendid use of early Edo period building designs, lavish paintings and carvings that Iemitsu generously commissioned. In 1867, when Yoshinobu, the last Shogun, returned sovereignty to the Emperor, the castle became the property of the Imperial family. In 1884, it was renamed the Nijo Detached Palace. It was donated to the city of Kyoto and renamed Nijo Castle (Nijo-jo) in 1939. This castle was designated as an UNESCO World Heritage Site in 1994. The Ninomaru Palace is characterized by the elegant, yet simple shoin-zukuri architectural style, which was favored by the warrior class. It consists of many linked sections. The entire floor area of the palace totals 3,300 square meters. It has 33 rooms and over 800 tatami mats. The superb wall paintings were done by prominent members of the Kano School. The Ninomaru garden is a large-scale garden called shoin-zukuri style. In the center of the pond stands one large island flanked by two smaller islands. THe original garden is said to have been the creation of Kobori Enshu, a master garden designer. This garden was constructed in 1965. The two teahouses and the stones in the garden were brought from the villa of a wealthy merchant. The garden is divided into two parts. One part is the Japanese garden with a large pond, while the other part, has a spacious lawn area. The garden has tow thehouses, Koun-tei and Waraku-an, which are used for receptions for honored guests.